When the Icelandic immigrants came to Canada, they left a country where the soil was only suitable for grazing. Even that grazing land was only about one percent of the total land because the rest of the country was covered in mountains, lava deserts, lava fields and glaciers. To make matters worse, during many years, because of cold weather, the grass didn’t grow. That meant there was no food for sheep or dairy cows and with the die off of cattle, starvation was inevitable. The only alternative food was fish and in particularly cold years , the harbours filled with ice so that inshore fishing with open boats was not possible. There were no other sources of food. Visitors to Iceland commented on the fact that farm land could be much improved with drainage. However, the return on drainage, given that it had to be dug by hand and because of the land ownership and rental system, was questionable. There were attempts to grow grain but those failed. In 1772, Governor Thodal planted barley. It grew well but before it could be harvested, a storm destroyed the crop. Governor Finsen tried to grow oats but it was never warm enough for oats to ripen. In the Faroes, the farmers were able to grow and harvest oats. At the end of the 1700s, the Danish government established model farms in Húnavatn. The farm managers tried to grow oats, barley, and rye. When walls were built to protect the grain from the cold wind, the grain nearly ripened. We think of Quinoe as a new discovery but in 1875 Burton mentions the possibility of it being grown in Iceland because it is grown in the Peruvian Andes at altitudes and temperatures where no other grain can grow. Hr. Haldorsen introduced the potato to Iceland and by the time that Burton is writing Ultima Thule, the potato is grown all over Iceland. It is small but satisfactory, he says. Burton suggests that people grow turnips. Radishes are grown but are ‘hard, coarse, and woody.” Spinach is a success. In the north-west the Stranda Sýsla has tried to grow various kales. Broccoli, turnip-cabbage, red cabbage, cauliflower. Lettuces are common; beets both red and yellow, carrots, onions, garlic, and shallots, chevril, black mustard, watercress, horse radish and parsley. Ultima Thule was published in 1875 so Burton‘s comments are relevant to the experience of our immigrant ancestors. His observations are not that the growing of these various food plants was widespread but, rather, that they were experimented with. The attempted growing of food plants is reported by other travelers at earlier times but those experiments were usually associated with the bishoprics where there was the influence of clerics from Europe. Therefore, when the Icelanders boarded ships to Ameríka, their wooden traveling chests were not filled with agricultural implements unless it was the short blade from a scythe. Their only crop was hay and their agricultural experience was limited to manuring a home field, cutting, raking and stacking the grass. They brought no seeds, nor garden implements, no ploughs. They came singularly unprepared for farming. In New Iceland and as they moved Westward toward Brandon, then Argyle, further to Regina and Swift Current, they learned to evaluate land, but often the lessons were costly both in resources and in lives. Graveyards and family stories testify to that cost. Many Icelanders began their journey westward from New Iceland shortly after they arrived in 1875. In the meantime, across the Rockies much had been happening during the 1800s. On Vancouver Island, the Hudson Bay Company established a number of farms in Victoria as far as Colwood. Settlers were arriving and they wanted to have their own farms. One of the first independent farms was bought by a Captain Cooper in 1851. It’s interesting that as the land was cleared, it wasn’t just farmed but sheep and cattle were grazed. That meant when the Icelanders arrived, there was already a precedent and experience in grazing animals locally. The first gold rush that brought American miners and others north was the Fraser Canyon gold rush of 1857. This rush was mostly over in three years but prospectors kept finding new gold areas. Most miners by necessity and by government decree entered the goldfields through Victoria. Business boomed. Then in 1896 to 1899 the Kondike goldrush began. A hundred thousand hopeful gold seekers headed north. Cattle ranching developed to feed the early gold seekers but spread beyond that goal as ranchers sought markets for their cattle. In 1876, the year the large group of Icelanders arrived in New Iceland, Thaddeur Sarper started a cattle drive to Salt Lake City. His goal was to put his cattle into rail cars and ship them to Chicago. Instead, seeing an opportunity closer at hand, he shipped the cattle to San Francisco. The ranchers also started fruit farming. Between 1864 and 1880 one rancher planted a huge orchard. In the meantime, on Salt Spring Island, apples had been growing since 1860. The first Salt Spring Island Fall Fair was held in 1896. By 1900 there were 80 official farms. The immigrants had left an Iceland plagued by severe weather that brought many of them to the brink of starvation. Their journey had taken some of them to Nova Scotia where poor conditions drove them away. They traveled to Kinmount where tragedy beset them and the land was not suitable for grazing or growing grain. They traveled on to New Iceland to face a dreadful winter and disease. Westward, always westward, looking for good land, for opportunity. When those immigrants who made it to the Coast stepped off a train in Vancouver, after a long and arduous journey, they were greeted with flower gardens, fruit trees, vegetable gardens, wild berries in abundance. They were greeted with cornucopia. When I was at the Saanich Fair this past weekend, I thought of those Icelanders who came to Vancouver Island in the late 1800s. 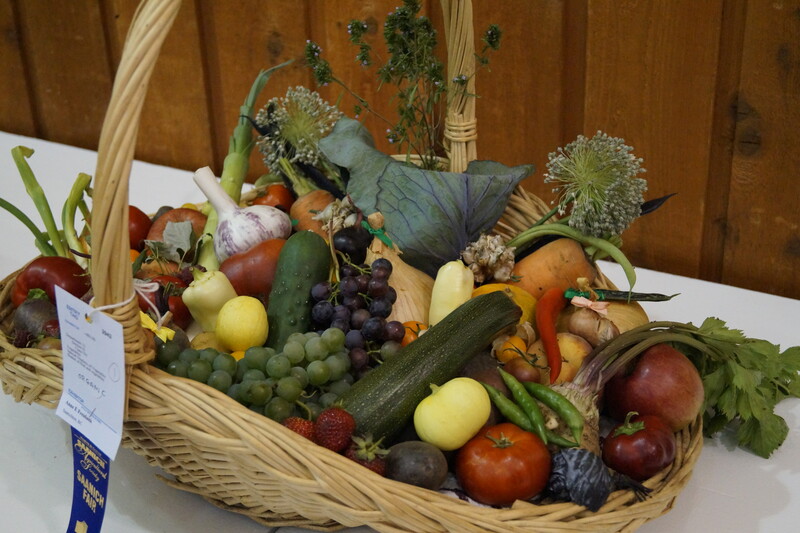 I gazed at the abundance of vegetables, fruit, and flowers, and when I came across a display of local produce in a basket, I thought Cornucopia, they were greeted by Cornucopia. To me that basket of fresh produce symbolized this new world they had struggled so long and hard to reach. Of course, sadness, hardship, disappointment did not end. Those are all part of life. Tragedy can occur anywhere but for most, the West Coast provided opportunity. Cornucopia! As I studied the basket on display with its blue ribbon, I thought of those immigrants as I stood there at the Saanich Fair. This entry was posted in Uncategorized and tagged 1875, abundance, Bellingham, Blaine, boundary bay, cornucopia, fruit, Hudson's Bay, Iceland, Icelandic immigrants, Saanich Fair, seattle, vancouver island, vegetavles, victoria by william. Bookmark the permalink.